I just finished Barry Lancet’s heart-pounding geopolitical thriller, The Spy Across the Table, and I really enjoyed the scenes which took place in and around the DMZ on the Korean peninsula. Having been there several times, both as a tourist and a feature writer for The Korea Times, I appreciate those authors writing about events on the Korean peninsula who try to incorporate the DMZ into their stories. It is an amazing, surreal place, “freedom’s final frontier” as one military PSA on USFK used to refer to it back in the 1990s. Inspired by Lancet’s book, and President Trump’s last minute unscheduled trip to the DMZ, which was scrubbed due to fog, it prompted me to share my experiences and accounts of the times I visited the DMZ. My first trip to Panmunjom and the Joint Security Area (JSA) was on New Year’s Eve, 1996 as part of a USO tour. Interestingly, the day before I went up there, the bodies of the North Korean commandos who were killed during the submarine incursion in September of that year were repatriated to the North. What was interesting about going on a tour was that after we listened to a presentation about the history of Panmunjom and the JSA, we had to sign a waiver which said that USFK (United States Forces Korea) was not responsible for our deaths should anything happen while we there. It wasn’t to heighten the tension either. In 1984, an East German tourist on a tour on the northern side of the JSA defected which resulted in a firefight in the JSA. One South Korean soldier was killed. Once you leave the confines of Camp Bonifas and head north to the JSA, that’s when things get intense with the concertina wire, minefields, and anti-tank barriers. The day I went to the DMZ it was cold and dreary which added a bit of atmosphere to the tour. Here you can see the Bridge of No Return where POWs were repatriated at the end of the Korean War. It was also across this same bridge, twenty-eight years earlier, where the crew of the USS Pueblo was repatriated in December 1968. It was also where the 1976 Panmunjom ax murder incident occurred where two US officers, Capt. Arthur Bonifas and Lt. Mark Barrett were killed by North Korean soldiers. I was in technical training school at Lowry AFB, Colorado when this happened. Years later, when I read about the murders and the military operation to chop down the poplar tree which had blocked the blue guardhouse as well as interviewing former JSA soldiers who were stationed there at the time for an article in the Korea Times, would I realize how close we were to another war breaking out on the peninsula. One of the highlights of the tour is the chance to walk into one of the Military Armistice Commission (MAC) buildings on conference row where military and armistice related talks between both sides have taken place over the years. It’s also where you can “cross” into North Korea so you can go back home and tell everyone that you have been to North Korea. If you’re lucky while you are there, you might get to see an NPA (North Korean People’s Army) soldier peering in to see who is on tour that day. Although the tour might seem straight out of some dystopian Disneyland with everyone going home at the end of the day, there’s a reason why Bill Clinton called this place the “scariest place on earth.” It was along the DMZ in the mid-1960s where North Korea provoked numerous border incidents which have sometimes been referred to as the second Korean War (in response to the South’s dispatch of two divisions to Vietnam as well as driving a wedge between the United States and South Korea). And from those events, it would morph into other incidents which have reminded everyone of the fragile peace which has existed on the peninsula since the end of the Korean War. It remains a scary place to this day. Freedom’s Final Frontier. There’s no question about it when it comes to exploring some of Korea’s natural beauty that many of its majestic, rugged peaks up and down the peninsula offer some of the more breathtaking and exhilarating outings for serious mountaineers and outdoor enthusiasts alike. No matter where one travels in Korea to seek a mountain adventure—whether it’s for a day or longer—there are plenty of peaks to scale and foothills to explore and enjoy. While some of the more popular mountain getaways like Mt. Sorak, Mt. Chiri and Mt. Halla on Cheju Island beckon outdoor enthusiasts with their rugged beauty and stunning vistas year-round, other summits like Mt. 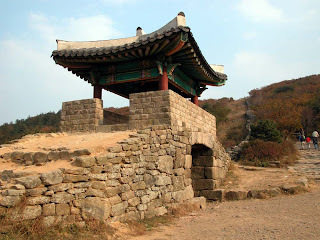 Pukhan in northern Seoul or the Mt. Namhan Fortress south of the city are equally magnificent and alluring. Not to be overshadowed by some of these more famous natural wonders across the nation, Mt. Kumchong in Pusan is just as impressive and worthy of a day or two of hiking and exploring. 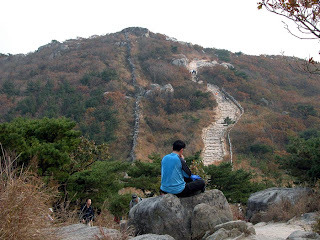 Famous for some of its more beautiful nature scenes in the Pusan area, the mountain also holds valuable cultural assets including Kumchong Fortress and Pomo-sa Temple. Sitting high on the ridges of Mt. Kumchong (790 meters/2,590 feet) and Mt. Sanghak (638 meters/2,093 feet) in northwest Pusan, construction on the fortress began in 1703 and was completed in 1807. With a height of 1.5-6 meters and an original length of 17 kilometers, the fortress was once the largest fortress in Korea. While only four kilometers of its wall remains today, the wall, which was rebuilt in 1970 and its two gates to the east and west are listed as Historic Site No. 215. 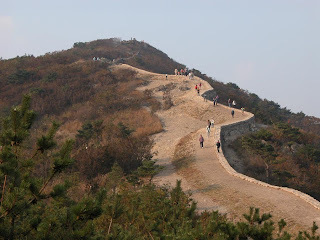 While there are numerous trails leading to entrances to the fortress and the summit, those looking for a more rugged and invigorating climb to the top of the summit might want to try the hiking course which starts from the left of Pomo-sa Temple and runs up to Pukmun (North Gate). This course, which can take a little over an hour to reach gate, is strewn with boulders and rocks of various sizes for a bit of strenuous rock climbing, but the course also has a few sections of steps for hikers to catch their breath (not to mention rest their weary legs) before proceeding to the summit. On the other hand, if you are looking for a more leisurely hike along the ridges, the East Gate, which is accessible by bus No. 77 from Onchonjang Subway Station, is the quickest way to reach the summit. From there, it’s only a four-kilometer hike to the North Gate which takes you along one of the more scenic views found in the Pusan area. Weather permitting; the views from the top of the fortress and along the ridges are breathtaking no matter what the season. It’s even possible to enjoy some of autumn’s colorful tapestry—but you’d better hurry. Much of the course between the East Gate and the North Gate is easily traversed along this well-laid out course with only a few arduous climbs over some of the more difficult terrain. One of the more noticeable features of the fortress are the rock formations called “tors,’’ which jut up from the slopes. These tors which are a jumbled mass of fracture-bounded granite blocks abruptly exposed along the ridges of the summit are what give the mountain its fortress or castle-like features. Formed during the interglacial and glacial eras, there are 50 prominent tors along the ridges and summit of Mt. Kumchong. Of these, Kodambang is one of the more famous granite tors at the top of the summit and the subject of countless photographs. 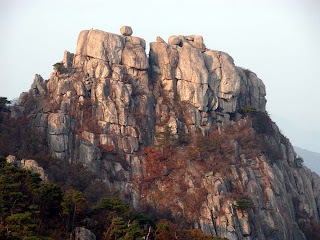 Although the fortress might not have some of the more rugged hiking courses found in other provincial parks or mountains, it still offers visitors a chance to experience a bit of Korea’s unique “mountain culture.” There’s just something special and refreshing about getting out and experiencing some of Korea’s rugged and natural beauty, not to mention the shared experience with other outdoor enthusiasts. Away from the hustle and bustle of Korea’s urban sprawl, this mountain culture manifests itself in many forms: from the friendly greetings and offers of food from other hikers to numerous vendors providing refreshments and bowls of instant ramyon for a quick snack along the way. Those with a lot of time on their hands will find the area adjacent to the North Gate a great place for a picnic lunch and time to relax before heading down to Pomo-sa Temple or the East Gate. 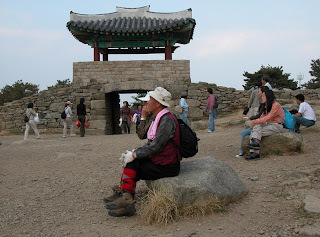 However, for a truly memorable experience, nothing beats taking a break by stretching out on some of the craggy rock formations at the top of the summit for an awe inspiring panoramic view of the fortress and Pusan in the distance before heading back down the mountain. Depending how much time one has to hike in the fortress, it’s also possible to combine a day at Mt. Kumchong with a visit to other attractions and cultural sites in the area including Pomo-sa Temple. Built in 678 during the Silla Kingdom, the temple, which is situated, halfway up Mt. Kumchong is one of the nation’s five great temples and designated Historic Site No. 176. Inside the temple, there are a number of cultural assets, including a three storied stone pagoda designated as National Treasure No.250, Taeungjon Hall designated as National Treasure No. 434, as well as Iljumun Gate (front gate), and Tanganjiju (two pillars supporting a pole with a large Buddhist painting). To reach the temple walk out of the subway station exit No. 5 and take to the first road on your right to a small bus terminal just one block west and catch bus No. 90. Buses run approximately every 10 minutes. For those with more time to spend in the area, Kumgang Park located at the southern edge of the fortress features a Buddhist temple, an aquarium, a zoo, a folk art exhibition hall, botanical gardens, pavilions, restaurants and a children’s playground. There is even a cable car, which runs to the mountaintop from the park below this walled mountain fortress to the South Gate. From here one can continue along the fortress wall to the East Gate and the North Gate. Also nearby is Tongnae Hot Springs, located 14km northeast of Pusan Station. First developed in 1691, during the reign of Choson Dynasty’s 19th King Sukjong, the spa’s long history has made it one of the most convenient areas for visitors to Pusan with comfortable accommodations and accessible cultural attractions in the area. It’s a great way to finish up your outing at Mt. Kumchong with a nice relaxing dip in the spa to soothe all those aching muscles.